Ideally located within the walls of Cartagena's beautiful and historic Old City, Republica Cartagena provides a unique and unforgettable experience. 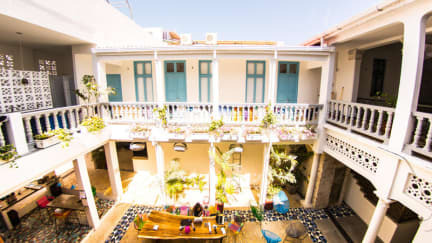 Focused on offering our guests an authentic Colombian experience in a fun yet relaxing environment, Republica Cartagena is the perfect place to soak up the rich culture, as well as the exciting nightlife, this iconic city has to offer. With over 100 dorm room style beds (each with their own locker), 2 private bedrooms, free breakfast and coffee, and a friendly local staff, you can be assured that staying at our hostel will allow you to make friends from all over the world, while still feeling like you're part of the Republica family. Every room is air-conditioned at night and our shared bathrooms and showers are cleaned daily. Located in a beautiful 3-story colonial building, our hostel has one of the largest courtyards in the entire Old City. Throughout the hostel you can find one ground level pool, one ground level bar, one ground level lounge area, one second-floor air-conditioned bar & lounge area, a rooftop deck with a hot-tub, great music, and a friendly local staff. Taxes not included - 19.00% (Only for Colombians people). Breakfast included, from 7:30am- 10:00am. Super helpful staff, beautiful hostel!! Would go back in a heartbeat! The only thing was that my clothes all shrank after I left them with the laundry team.. other than that, all AMAZING. O hostel é uma graça, tem uma ótima localização, promove festas ótimas para conhecer pessoas. Os funcionários não são cordiais, tirando o funcionário que nos recebeu à noite. O café da manha, você pode escolher duas opções e anotando num caderno eles preparam o cafe porém se você pedir para que mudem algum ingrediente eles simplesmente falam que não vão mudar e temos que obrigatoriamente escolher a outra opção ou não comer nada.